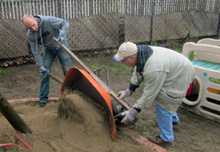 VillageHelps volunteers help with yard work. Wanting to reach their community and help others in a tangible way, The Village Community Church, a Grace Brethren congregation in Milton, Ontario (Rob Stanley, pastor), launched a program last year called VillageHelps. Projects are selected based on need, achievability, location, and impact. “We’ve been getting emails and inquiries from people who tell us about their neighbors or they know other people who need help, because the people who need help don’t always come to you,” says Adomanis. The program takes on a variety of types of projects. For example, a woman with terminal brain cancer was brought to the attention of the VillageHelps team. Volunteers provided meals and cleaned her home so she could spend time with her two young children. The church also helped with a fund-raising campaign to send her and her two sons to Disney World before she died to create positive memories for the children. 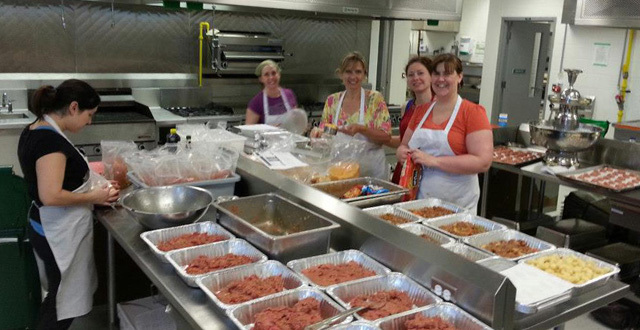 “The Big Cook” yielded 35 meals for a needy family, while allowing participants to take home a few for their own use. “Several of the ladies in the church befriended her and although she was hesitant in receiving spiritual guidance, the friends around her took an interest because they just couldn’t believe that anyone would be so helpful and caring strangers would come alongside her,” Adomanis recalls. VillageHelps teams have also rallied around a family who needed assistance with getting their property ready for the spring. The father was out of work and the mother had to care for their youngest son who was stricken with an undetermined neurological disorder that left him paralyzed on his left side. The team dug a drainage ditch, cleared brush, tore down a shed, and did other landscaping projects. They also cleaned up some used vehicles to sell so the parents could have money while the father continued to search for employment. Ongoing assistance projects have continued over the past two years as relationships have grown with this family. Other projects included helping Village attenders. “One of our own families had tragedy mixed with unexpected blessing,” reports Adomanis. “The father was rear-ended in two separate [traffic] accidents leaving him unable to work. At the same time, his wife became pregnant with triplets (in addition to their other three young children).” Volunteers cleaned their home and prepared meals, and, while the mother was bed-ridden, provided childcare and housekeeping after the triplets were brought home. It became such a big project that a new idea was birthed – aptly nicknamed “The Big Cook.” Several Village ladies found recipes for feeding large groups and broke them into meals for four. The ladies paid for everything and completed all the preparations in one day. 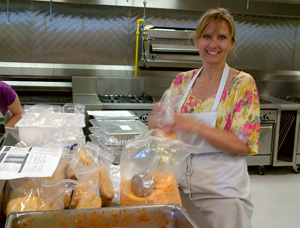 The result was 35 meals for the family in need, while each participant took home 10 meals for her own use. Another Village family adopted three young sisters, in addition to their own three children, but they had no bedrooms to house them. Over a period of three weeks, several skilled and unskilled VillageHelps teams completed the basement with bath and bedroom space for the sons so the younger girls could be upstairs together. Most of the materials were donated to help ease the burden of the adopting family. For the volunteers at VillageHelps, meeting people’s physical needs goes hand in hand with ministering to their spiritual needs. This story first appeared in GraceConnect eNews. To subscribe to the weekly electronic e-newsletter, click on the orange button in the upper right of this page.